This might seem like a no brainer, but checking the weather before you leave on a trip could save you from a potentially dangerous situation. 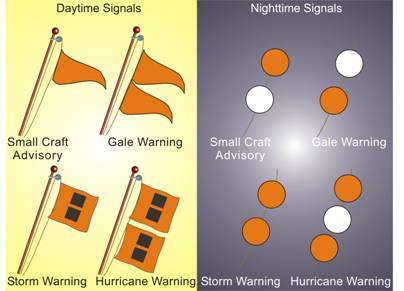 The United States Coast Guard has a program that will display warnings via flags, pennants, and colored lights. These warnings are displayed at Coast Guard stations, marinas, and yacht clubs as a way to warn the public of approaching weather conditions. Small Craft Advisory – This type of warning is issued when there are sustained winds, frequent gusts, or the wave size exceeds an average or normal size and/or power. This type of warning can also be issued when there is ice that could be hazardous to small boats. Gale Warning – When winds are between 34 and 47 knots are forecasted for the area. Storm Warning – When winds are 48 knots or above, a storm warning is issued. If these types of winds are associated with a hurricane, the winds are forecast to be between 48 and 63 knots. Hurricane Warning – When the winds are 64 knots or more and in connection to a hurricane coming, this warning will be issued. Special Marine Warning – Whenever a severe local storm of brief duration is predicted to hit, there is no sort of warning issued by flag, pennant, or lights. To know about this type of weather you will need to be tuned into a NOAA Weather Radio station or U.S. coast guard commercial station.